I love puzzle games, adventure games, and also cute little animals. TUNIC is all of these and more. TUNIC is an adventure game by Andrew Shouldice, and it is still in development at this stage, so it is now the time to prepare for excitement, and maybe some squealing if you are me. Why? Because you play as the cutest little fox ever. And I swear that’s not the only reason why TUNIC should be on your radar. But it might be the primary reason I got really excited at first glance. Beyond that, the game is so much more. So yes, you play as a cute little fox wearing a little tunic and carrying a sword. It’s adorable. But, you also are going on a great adventure and exploring ancient ruins while fighting off these scary monsters. The game has a classic 3D puzzler feel to it, with giant worlds to explore. You go from wilderness to ruins, and within there are dangers and items to find. The game reminds me a lot of the Legend of Zelda series. And while that might be because the little fox is dressed a lot like Link, I think the gameplay is also reminiscent of it. The battle sequences are much like the swordplay of Zelda games. You can even smash pots! You have different attacks to utilize and enemies who succumb differently as well. As you play, you will figure out how to defeat every encounter and move further into the story. The art in TUNIC is also pretty cute. You can see some of the influences from Zelda again here. But for the most part, it’s something new and it’s own. It has an isometric style, with cartoon influences. The characters are either very cute or a little terrifying. The environments and the maps are wonderfully detailed. Some of the ruins have interesting mechanics that are animated with interesting effects. Overall, it’s a beautiful game to behold. 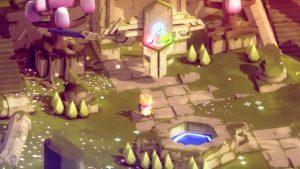 TUNIC is actually being developed by a team of one. That’s right. This entire game is being created and mastered by a single person. So, while we are so excited for it’s release, we can understand why it might be taking a while. It is entirely impressive that the whole game is being created by one person though. And even more so when you know that the game ended up at E3. Okay, so we actually don’t have a date… again. There is some talk about a 2019 release date, but nothing official as of yet. For now, you can wishlist it on Steam. If you really want to follow the progress though, I’d highly recommend following the game’s Twitter page. There you can see how things are going, and also there’s lot of cute fan art.